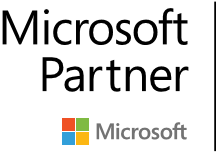 This solution will allow you to immediate analyse the insights collected from your water smart meters. 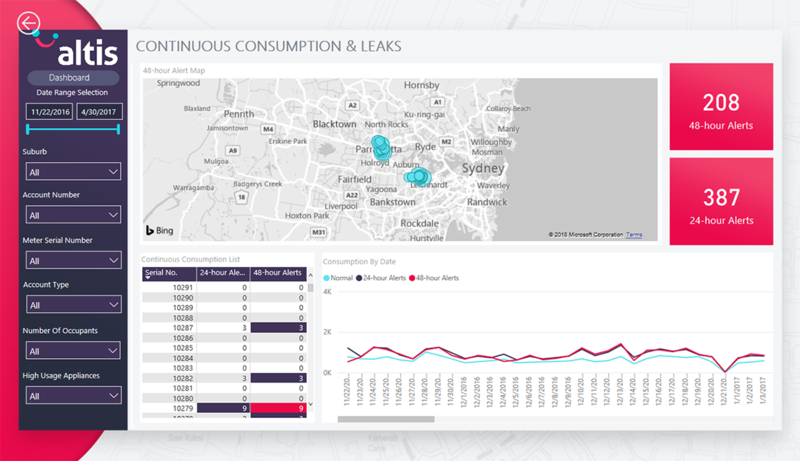 These ready to go dashboards allow insights into your usage trends, customer behaviour, continuous consumption and correlates consumption with weather data. They allow you to gain insights from your smart meter waters from the start enabling better decisions and outcomes for your utility. Smart meters are increasingly being trialled, implemented or in the stages of planning a pilot or implementation at water utilities. The benefits smart meters can provide are great and the industry is moving the leverage these benefits particularly around the greater levels of data that are become available to utilise. However the workload of selecting, implementing devices and associated technology platforms often means the analytics of smart meter data is deferred. Altis Smart Meter Analytics solution will enable any water utility to immediately analyse the data collected from their smart meters. 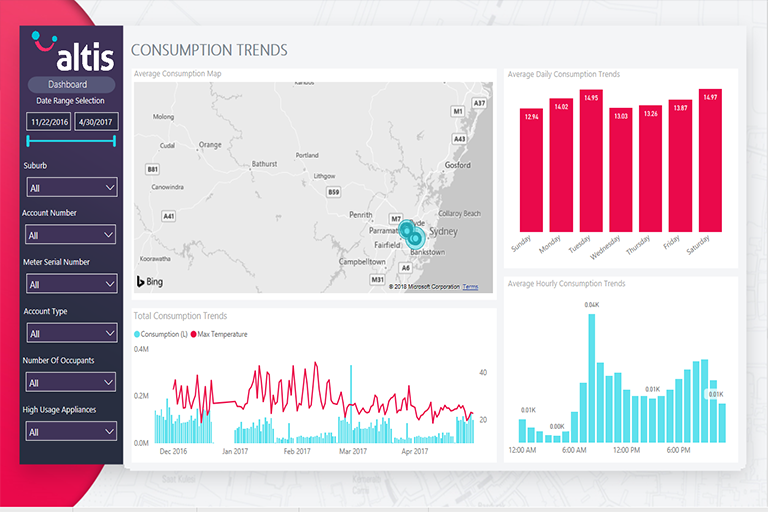 Consumption Trends- Allows a spatial view of users and consumption levels, average consumption trends over hours, days, weeks, months and mapped against weather data such as temperature. 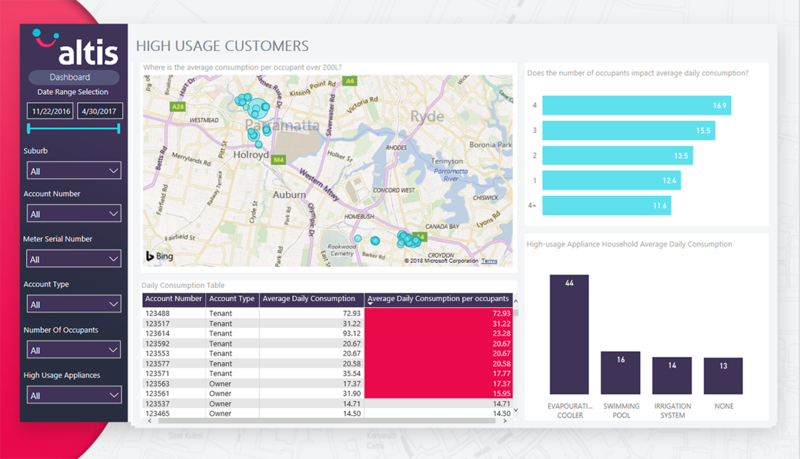 High Usage Customer – Displaying on a map customers with average consumption above a certain threshold, a view of high consumption related to occupancy and high consumption related to appliances. Continuous Consumption and Leaks –A view of 24hr and 48 hr continuous consumption or flow alerts, a map of all incidents, meter serial numbers for alerts and alerts over time. 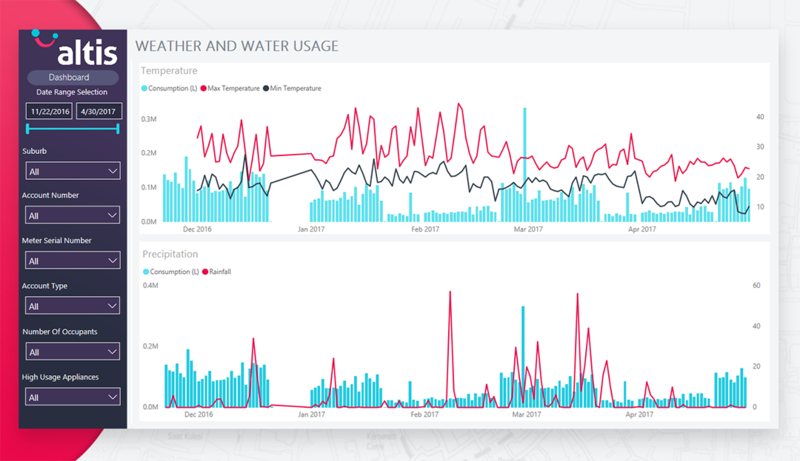 Weather and Water Usage – consumption overlaid with weather data such as minimum temperature, maximum temperature and rainfall over time. Customer Profiles and Water Usage- Consumption breakdowns via account type, suburb, hardship, pensioners as well as hourly and daily trends.